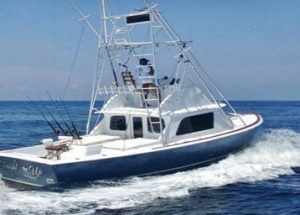 This newly-refitted and customized 31ft Bertram powered by twin 350HP Caterpillar diesel engines fishes out of Los Sueños Marina in Playa Herradura. Captain Bill McMenemy is at the helm, assisted by a bilingual mate. It sports an air conditioned cabin, large cockpit with fighting chair, a full tournament-class range of Penn International, Fin Nor and Shimano tackle, along with a full electronics package including depth sounder, chart plotter, and GPS; and all the required US Coast Guard-approved safety equipment.